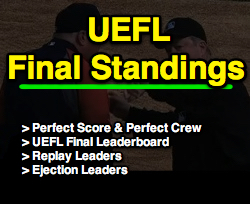 With the championship and UEFL awards season now complete, we can now reveal the Umpire Ejection Fantasy League's final standings for 2018 as well as this year's Perfect Crew. The Perfect Score this season was 117 while the lowest possible score was -39, a spread of 156 points. (compare to 2017's Perfect Score of 112 and lowest score of -39). Related Post: 2017 UEFL Final Standings and the Perfect Crew (11/10/17). 2018 UEFL Perfect Crew (Highest Score): 117 points. Crew Chief: Bill Welke (19 pts). Primary Umpires: Joe West (31 pts) & Brian Gorman (25 pts). Secondary Umpires: John Tumpane (21 pts) & Ted Barrett (21 pts). 2018 UEFL Imperfect Crew (Lowest Possible Score): -39 points. Crew Chief: Tom Hallion (-6 pts). Primary Umpires: Brian O'Nora (-8 pts) & CB Bucknor (-6 pts). Secondary Umpires: Phil Cuzzi (-10 pts) & Sam Holbrook (-9 pts). Final Standings for the 2018 UEFL Season. 1) Chad Fairchild (.722, 13-for-18). 2) Fieldin Culbreth (.714, 15-for-21). 3) Tim Timmons (.714, 10-for-14). 4) John Tumpane (.684, 13-for-19). 5) Brian Gorman (.667, 16-for-24). 6-T) Mike Estabrook (.667, 8-for-12). 6-T) Brian Knight (.667, 8-for-12). 8-T) Lance Barrett (.647, 11-for-17). 8-T) Ed Hickox (.647, 11-for-17). 8-T) Jeff Nelson (.647, 11-for-17). 12) Pat Hoberg (.643, 9-for-14). 13-T) Mike Muchlinski (.636, 7-for-11). 13-T) Stu Scheurwater (.636, 7-for-11). 15) Jim Wolf (.625, 5-for-8). 16-T) Ted Barrett (.619, 13-for-21). 16-T) Ryan Blakney (.619, 13-for-21). 18-T) Tripp Gibson (.611, 11-for-18). 20) Joe West (.600, 12-for-20). Full Results: UEFL's MLB Umpire Replay Review Statistics and Sabermetrics. 2-T) Andy Fletcher, Tripp Gibson, Brian Gorman, Adam Hamari, Hunter Wendelstedt (6). 7-T) Eric Cooper, Joe West (5). 9-T) L Barrett, Blaser, Eddings, Foster, G Gibson, Porter, Rehak, Ripperger, Tumpane (4). 2) GDK Team Blue (78 pts). 3) toss 'em (72 pts). 7) jbenedek (65 pts, 21 PRM-A [T Barrett]). 8) DNS67665 (65 pts, 16 PRM-A [Wendelstedt]). 9) Yuri.macchiavelli (65 pts, 15 PRM-A [Carapazza]). 11) oki96 (63 pts, 31 PRM-A [West]). 12) southsidehitman (63 pts, 25 PRM-A [Tumpane]). 13) Michael (63 pts, 15 PRM-A [Carapazza]). 14) RadioPearl (63 pts, 0 PRM-A [Bellino]). Complete Final Standings, points, and results available via the UEFL Portal's 2018 Standings page. Umpire Leaders available at UEFL's MLB Umpire Replay Review Statistics and Sabermetrics page.